Freshly unearthed bones prove that mammoths once roamed at the home of the Oregon State University Beavers. Dozens of skeletal remains, possibly as old as 10,000 years, were all dug out of the college’s football stadium. “Some of the bones are not in very good shape, but some are actually quite well preserved,” Loren Davis, an associate professor of anthropology at OSU, said in a statement. Davis was called to the scene in the Willamette Valley immediately after construction crews came upon the incredible discovery on Monday. Work on the football center’s expansion started right after the Beavers’ season ended. 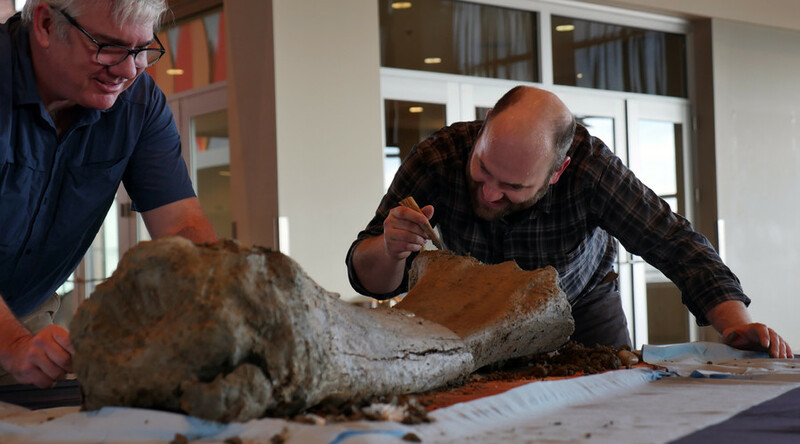 It all began when construction workers found a 10-foot femur bone, “likely of a mammoth,” beneath the north end zone of Reser Stadium. This find led to many more discoveries nearby. “There are quite a few bones, and dozens of pieces,” Davis said. Scientists still need to conduct analyses to determine the bones’ exact age, but they may be as old as 10,000 years. Davis is going to preserve the bones from further deterioration by soaking them in water before sending some out for carbon dating to better determine their age. While the discovery does sound incredible, Davis said finding ancient mammal bones in that area is not so rare, given that there was likely a bog or marsh there thousands of years ago. “Our archaeologist believes this could have been the location of a pond, a watering hole for these animals,” Clark said, “or a place where they came to die.” This could explain the location’s wealth of findings. Scientists have discovered the remains of a mammoth, bison, and some kind of camel or horse nearby in the past. However, since there are no human bones in the discovery, the bones are not considered part of an archaeological site. Davis now plans to take his students to excavate a large pile of dirt from the site to see if they can find other bones.